Synthesis and Evaluation of 18F-labeled MAO-A Inhibitors The monoamine oxidase A (MAO-A) is responsible for the oxidation of amines from endogenous and exogenous sources. Main substrates are serotonin (5-HT), dopamine (DA) and norepinephrine (NE). The monoamine oxidase A is seen as an interesting target for a better understanding of neurodegenerative diseases, like Alzheimers disease, or neurological disorders, like schizophrenia. 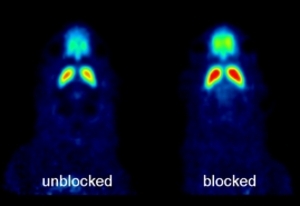 Several 11C-labeled MAO-A inhibitors for molecular imaging have been developed so far, e.g. [11C]harmine has been already used in animal or competition studies in humans. To overcome the limitations in half-life of the already used 11C-labeled tracers our aim was to synthesize 18F-labeled compounds. Therefore derivatization at the phenolic part of harmol was performed to get precusors for 18F-labeling. First µPET studies were performed (Fig. 1). Fig. 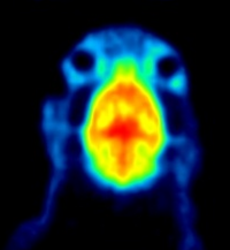 1: Coronal slices of the brain uptake of [18F]FEH in sprague Dawley rats. 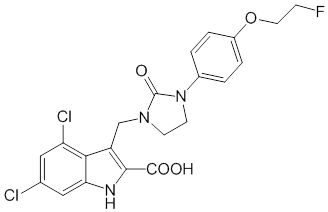 In order to visualize the receptor status of the NMDA receptor, various derivatives of the 4,6-dichloro-indole-2-carboxylic acid (see Figure) have been synthesized, which possess a high affinity for the strychnine-insensitive glycine binding site. Since these compounds do not penetrate the blood-brain barrier, because of their low lipophilicity, currently various ester prodrugs are synthesized to increase their lipophilicity. Thus, a sufficient brain uptake of the ligands should be achieved and after successful passage of the blood-brain barrier the ligand set free by enzymatic cleavage of the ester. The optimization of the synthesis and the evaluation of the compounds is performed with using the 4,6-dichloro-indole-2-carboxylic acid as a model compound. It is assumed that the substitution pattern in position 3 has no influence on the rate of ester cleavage. The aim of this study is to synthesize esters, which are cleaved in suitable periods of time in order to achieve a high brain uptake of free the ligand. γ-Aminobutyric acid (GABA) is the primary inhibitory neurotransmitter in the mammalian central nervous system and binds mainly on ionotropic GABAA-receptors. These receptors play an important role in neuronal functions and are associated with various neurological disorders (anxiety, schizophrenia, epilepsy). Therefore, 18F-labeld ligands and the imaging by the positron-emission-tomography (PET) are valuable tools to study the receptor availability as well as the release of GABA from presynaptic neurons. Various Isothiazol- und isooxazoles derivatives have a high affinity towards the GABA binding site and seem to be promising lead structures for the development of PET-tracers. Different compounds of the shown lead structure were synthesized in earlier works but were gained radiochemical only in bad yields. Furthermore the synthesis could be performed under high expenditure of time only, a use as routine-tracer seems to be impossible. Hence, a new approach via diarlyiodonium precursors is currently under examination, which should obtain the ligands in shorter synthesis times and higher radiochemical yields. [18F]Fallypride is an important and routinely used ligand for quantitative imaging of the dopaminergic neurotransmission with positron emission tomography (PET). Recently it was shown that brain uptake of the structurally similar dopaminergic tracers is modulated by P-glycoprotein. P-glycoprotein is an important transporter protein located at the blood-brain barrier (BBB), which acts as an active efflux pump for a wide range of compounds. In former studies it was shown that P-glycoprotein has a protective physiological function in the BBB by preventing the entrance of neurotoxic substances into the central nervous system. Hence, the purpose of this study was to investigate possible effects of P-glycoprotein on the brain uptake of [18F]Fallypride in µPET studies in rodents. Therefore the brain uptake and the uptake kinetics of this tracer were examined in different groups of rodents to evaluate a potential influence of this transporter.